Woot! 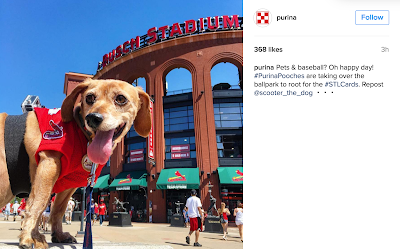 We're on year THREE of being invited to Purina's Pooches in the Ballpark (check out 2014's here and 2015's here) and it just gets better and better! This year Mike unfortunately had to work, so Scooter and I invited our besties Lauren and Braxton to come with us! And we decided to have the pooch boys be matchy-matchersons with their Cardinals shirts and GoPro's mounted on their backs. Genius, eh?!! Scoots and Beanie were super duper excited for this year's festivities -- can't you tell?!! Once we got downtown Mike actually gave us a lift from where we parked to the stadium, which was super nice. We got all signed in and then drumroll, we waited! Scooter this year, being the elderly 11 year old he is, was POOPED once we got to the waiting area for the parade once inside the stadium so he just laid down -- a rarity for him! But his GoPro was snappin' away and kept getting all of the admirers for his cute little costume and camera. Once the parade was underway Scooter was in his element, being all dashing and fashionista around the warning track. Braxton was eating this up too and both of them were strutting along and really enjoyed getting their pictures taken, both by us and the guy operating the jumbotron! After the parade festivities we got to our seats which thankfully were covered -- SHADE! Much welcomed on this warm warm WARM day! and chowed down on the buffet of free food. Both of the dogs enjoyed some beverages and relaxing (Braxton literally fell asleep in Lauren's arms!!) before we had to head out early because we had a wedding to attend to. I did snap this dashing pic of Scoots in front of the stadium which Purina then posted on their Instagram account! And then since we left early I had a few friends text me that my selfie with Scoots was on the jumbotron during the game too! One of them got a pic of it and sent it to me -- so cool, huh?! All in all it was a fantastic day once again at Pooches in the Ballpark. We are so thankful for our buddies at Purina for spoiling us once again and sending Scoots to the game! It's most definitely the highlight of his year! And we were so glad that our buddies Braxton and Lauren got to indulge with us again this year too. So much fun! Okay! That's it! I'm pooped and off to bed...next stop: Florida!